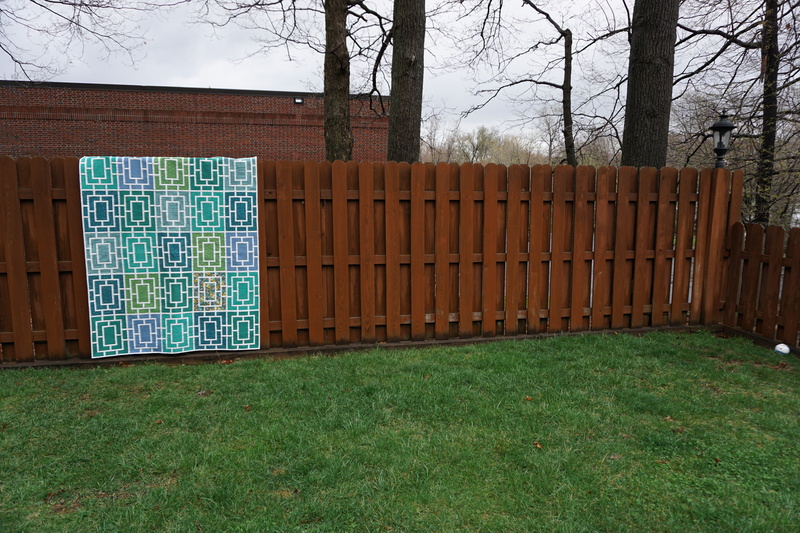 I have loved looking through the collections of quilts in the Blogger’s Quilt Festival over at Amy’s Creative Side each year during Quilt Market. But for one reason or another, I never seem to get a post up to participate. This year, I am on the ball! I am so proud and happy to share the Green Peek quilt in the Original Design category. 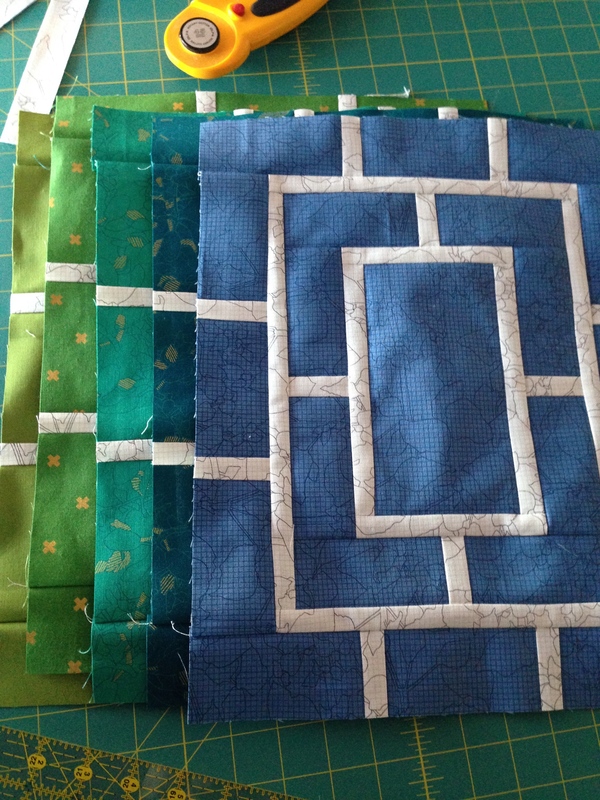 I knew that I wanted to make it a pattern and that I needed to have a quilt made with nothing but Peek blocks. 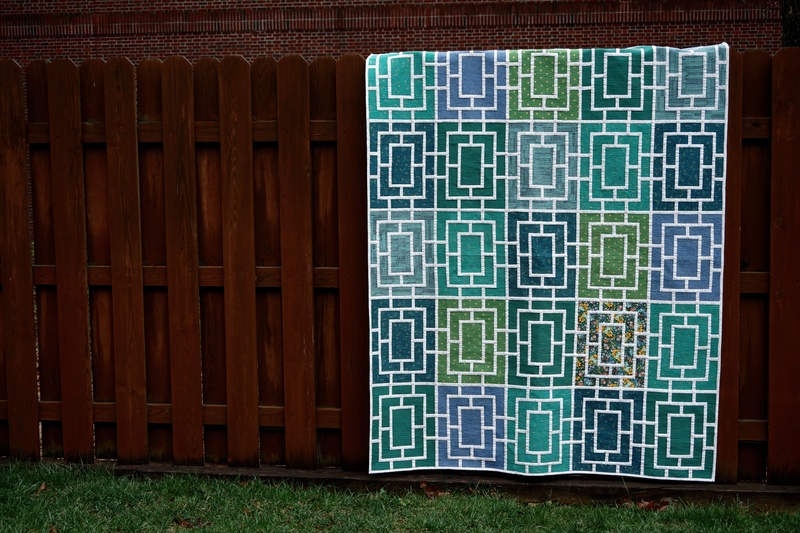 I knew it would be a long process, and I took care to select fabric that I loved– greens, teals, and blues from Carolyn Friedlander’s Botanics and Doe, along with Cotton + Steel basics and Kona Willow. The skinny piecing is Grid in Charcoal from Botanics. 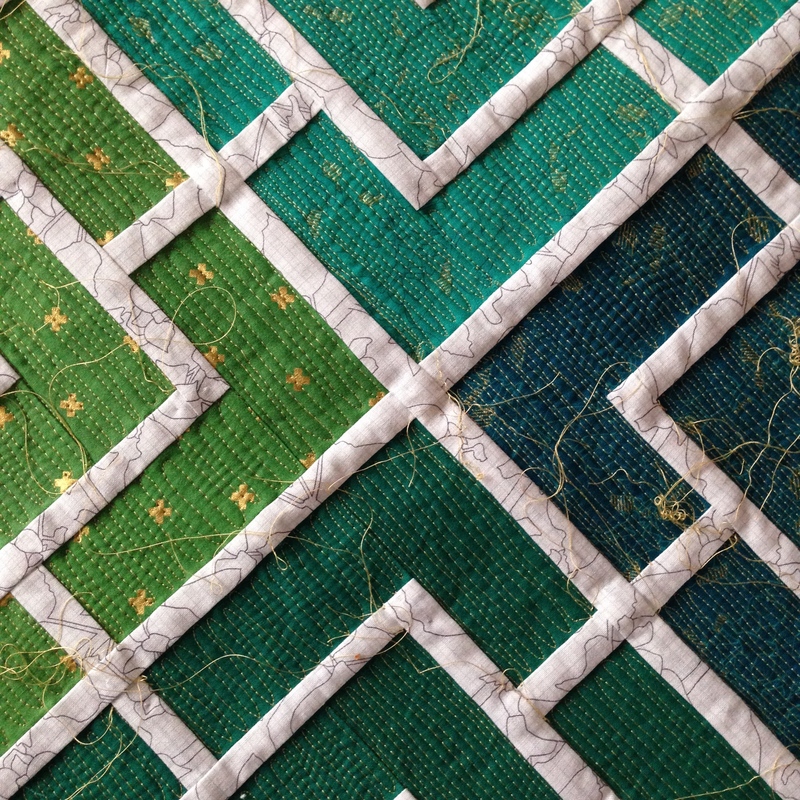 The accent block, which contains all of the shades of green and blue (plus one of my favorite shades of yellow), is from Anna Maria Horner’s Honor Roll collection. As my Instagram friends know, I chose a very time-consuming quilting pattern, matchstick free motion waves, in order to accentuate the design with texture. The skinny pieces are raised, and I just love running my hands over it. The thread is Aurifil Light Brass, and it plays off the gold metallic prints and the gold flowers in a way that just makes my eyes happy. With their cheerleading, I quilted the whole thing in one intense week. The reason why this quilt will forever hold a special place in my heart is because it is my very first self-published pattern. If you’d like to make some Peek blocks, or a whole quilt, the pattern is in my Etsy shop. Thank you for taking the time to visit and check out my quilt! I’m so excited to participate in the festival. 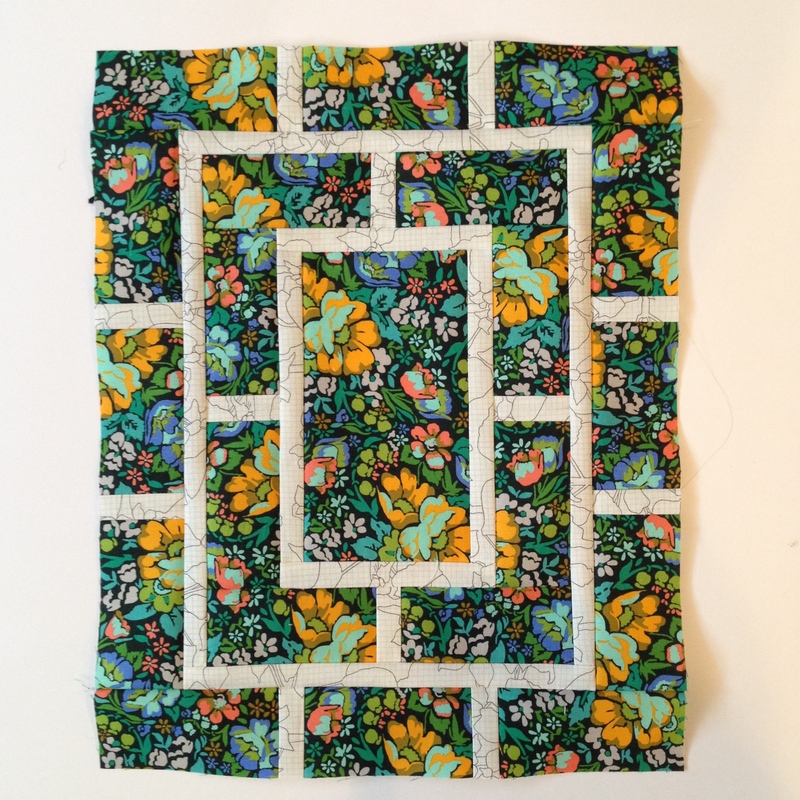 Click through and take a look around at all of the inspiring quilts posted there. ← Peek pattern is here! I love this pattern, Mel. And the quilting for is is just phenomenal. I know it took forever, but it was so worth it! I am so excited that you are linking up to the festival with this quilt, Mel. It is stunning and obvious that you put a lot of thought into everything from fabric selection to quilting thread color and pattern. Such a fantastic quilt! Glad to see it in the festival! Best of luck, this gorgeous quilt deserves recognition! I love the design of this quilt and the quilting is amazing! You have my vote! This quilt is absolutely stunning. Love it! I love the colors and especially the prints! Such a gorgeous quilt. It’s amazing! it is a fabulous quilt, great design, fab colours and I love the quilting, those raised skinny bits are just brilliant! This is incredible Mel, and I am so glad you entered this one in the festival. I enjoyed seeing its evolution on Instagram! Congratulations on your first (of many, I’m sure) quilt pattern.